YOU might have guessed by now that I’m a big fan of TV drama. So I was delighted to be asked to write the interviews for the launch of ITV Encore. A new top quality drama channel launching on Sky Channel 123 at 7pm tonight (Monday June 9). I spoke at length to ITV Director of Television Peter Fincham. And to Broadchurch producer Richard Stokes who had some interesting revelations. Including details of a series one scene that never made the screen during the original run. Plus other details about the series you might not know. 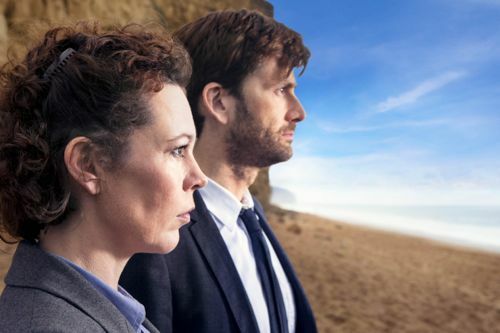 Broadchurch series one begins on ITV Encore at 9pm tonight with a double episode each night until Thursday’s extended finale. Other highlights will include Mrs Biggs, The Bletchley Circle, Breathless, Lucan, Agatha Christie’s Poirot, DCI Banks and Vera. Posted in News and tagged Breathless, Broadchurch, DCI Banks, Ice Cream Girls, ITV Director, ITV Encore, Lucan, Mrs Biggs, Peter Fincham, Poirot, Richard Stokes, The Bletchley Circle, Vera. Bookmark the permalink.